Skimming the news ... The Islander football contest continues, page 14. Like Yogi Berra said. "It's deja vu all over again." storm in the past six weeks to brush past the Island. Melbourne, then move up the east coast. as hell, and he's not going to take it anymore. bors are suffering, he said, and no one will help. tal today for some of the elderly folks up here." Operations Center and, he said, "it's closed. elderly and for the city to urge FPL for attention. him she'd work on the problem. vice can remove some downed limbs. is that you want a 28-foot home on a 25-foot home lot." home in the Sandpiper [mobile home park]." trees and to free the power lines for the FPL crews. 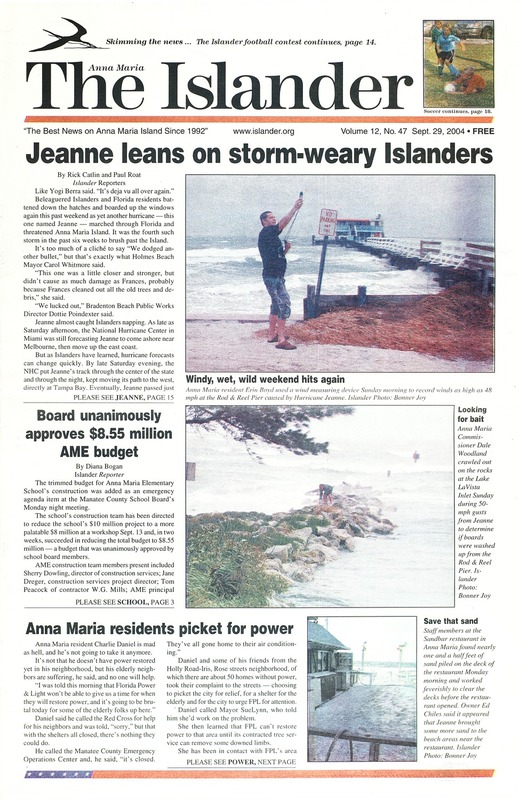 lems for all the residents of Anna Maria. higher, with a setback variance" granted by the board. for the code revision currently under way. codes at least once every 50 years." /^- -' :i) = .. Please call in "special" reservations in advance. Manatee County's beaches are on the Island. servancy and locally by Tropicana. in case of a tropical storm is the next Saturday, Oct. 9." items the team agreed upon during its meeting. would give the building an "Island" style. tained an additional 26 parking spaces. The existing auditorium will be partially renovated. tion to avoid the need to bring it entirely up to code. be a suitable emergency shelter for students. an additional $250,000 for this renovation. the new campus in addition to extra classrooms. remaining oak trees will not be removed. ing lot, 200 Gulf Drive N.
and 126 miles of roads and highways, McClellan said. ""~ .___-' ... -. -. .. .. - "
i . ... _" . renovated. To the right of the new classroom building, the existing covered play area will remain unaltered. design from 76 to 50 spaces. construction, money was saved in other areas. the capacity to do more if money becomes available. can be designated elsewhere, such as to the auditorium. should see dirt moving as quickly as possible. held at Holmes Beach City Hall. Oct. 7, 7 p.m., city commission meeting. Sept. 30, 7 p.m., planning commission meeting. crease significantly for the 2004-05 fiscal year. few paying for the many. budget for 2004-04, or 15 percent of the total. live on Anna Maria Island and Longboat Key. thank property owners here for supporting education. $8.24 million (1.8 percent) of that budget. county pay 15 percent of the budget. east isn't helping pay more for schools and the budget." Island into a giant condominium or rental unit. budget for the people who don't live here," he quipped. staff and find out just exactly what is going on. of the tax burden. There may, however, be a solution. services for what Islanders pay in taxes. where and how our taxes are spent," she said. ernmental bodies, agencies, services and budgets. land businesses (The Islander, Sept. 15). chamber doesn't plan to ignore the problem. able to fix or at least alleviate the problem. A Valuable Emergency Planning Portfolio. It provides the answers your family needs ... when they're needed the most. Family History. your vital information and papers? Insurance/Will Information. EXACTLY how to collect them? No Purchase Necessary. day of your family's life? YES, I am interested in receiving the FREE Emergency Planning Portfolio. cracked or chipped ooth today. ceramic crown while you wait. No second visit required. Tooth restoration never looked this good or was so easy! New patients welcome! cares away. missioners what part of "no" don't they understand. than approve the lease by an ordinance. times to the same question. missioner Dale Woodland reminded his colleagues. site plan is incomplete, Woodland added. in her opposition to the ordinance. "I support the Waterfront Restaurant 100 percent. up signs saying those spots are for restaurant patrons. Romeo, green. Not pictured was Amanda Rodriguez, green. Ben Cooper and Associates Inc.
come, first serve" basis, Dye said. dinance to get the restaurant back in business. lizes on-street parking because it doesn't meet the code. a top priority," she said. parking compliance against the code, he said. suggested that $1 per year was too low. Aug. 2, was not at this meeting. casting the lone vote against the measure. Heats and stores up to 80 gallons of water. and leave to us the task of preparation. hadn't yet removed their prior storm protection. ting ready because they were "sick and tired of it." Wales, that saw the eye of three strong storms. yet to be given a name. uted largely to the demise of one Island charter school? are needed to get this project under way. loved building for too long. the people in the know get on with it. beaches or protection for our homes or wildlife. Stop using taxpayers' money to plant palm trees. way a shame you would miss sleep. east, south and north have gone through. precautions are needed, or evacuation information. nized the program, and to Kathy Hayes, principal. pecially Commissioner Lisa Marie Phillips. side was not buildable and is in the preservation zone. a permit based on a site plan (expired in 2002). Community Affairs and various state agencies. etc. ority in coastal and beach systems). .
in Bradenton Beach, which is losing voters. that so much is known. me in a store during my vacation in Bradenton Beach. they were right there in the store with me. never been exposed to crime before this. more precious than cash or possessions. safe destination could be even harder to repair. make best use of it to help people rebuild. it approximately 5 p.m. daily. '. *^* -" : *- *.- "
* , . 12' .* . Sfect way to stay in touch with what's happening on Anna Maria Island. round, or if you want to mail the paper to a friend or relative, please use . this form or log on to islander.org for secure e-mail transmission.
. Call for mail rates to Europe or other countries. merly Holmes Beach, died Sept. 21.
cluding the U.S. Treasury Building. of architecture at Yale University. tured in House Beautiful magazine. able at the gallery for more than 10 years. to a role as one of the set designers for the Island Players." Hand the Rocks the Cradle." notable' role as Elwood P.
Dowd in the comedy "Harvey,"
decided to be very nice." his charm, wit and kindness over the years. Elfenbein after Oct. 6 at 778-4412.
brary, 5701 Marina Drive, Holmes Beach. The library will be closed the morning of Oct.
Oct. 9 at 10:30 a.m., family origami class. Gulf Coast Writers group will meet at 10:15 a.m.
available at 792-5295 or 729-2399. Lutz, Bobo & Telfair, P.A. is rated "AV" by Martinlale-Hubblll, thie nationally reognized law firm rating errvire. The hiring of a lawyer is an important decision that shioul not I lIased solely upon advertisetlent,..
your home. It'll last and last and last. Call for more details. attention, and to send them a very special gift. ber and an Islander staffer. his wife and their two children to the Island for a visit. country, with students taking a vital part. O Caring staff in an inviting atmosphere. Just a short drive onto the Key. ILongboat (941) 383-7300 5650 Gulf of Mexico Dr.
OUR OFFICE IS CLOSED FOR LUNCH NOON-1 DAILY. you have no family to take care of." by my boss in Afghanistan." rent budget period almost $99 million. begins Oct. 1, the value is $434,981,500. get during the public hearing portion of the Sept.
Anna Maria Island Chamber of Commerce. questions must be in writing and submitted at the door. Beach City Hall, 5801 Marina Drive. The second will feature 13th District U.S. Rep.
Bridgewalk, 105 Bridge St., Bradenton Beach. mils, the same rate as last year. sioner was absent from each of those sessions. seven deputies in Anna Maria. MCSO took over in the mid-1980s. Anna Maria calls. "It just won't work," he emphasized. Dale Woodland cast the dissenting vote. and a new one should be put in the 2005-06 budget. enues increased by 13.3 percent to $1.125 million. miserably after Hurricanes Charley and Frances. exhibit of his photographic abstractions opens. of Fine Arts and the Art League of Manatee County. day. Further information may be obtained at 752-5225.
and personnel to Longboat Key, he said. SueLynn and Holmes Beach Mayor Carol Whitmore. "We're not even going to call Grubbs anymore,"
even WMI got itself in a pickup jam. "They overextended themselves," said Whitmore. not all of the debris has been picked iup," she said. ricane or storm, so her city won't get "caught short"
canes threatened the Island within a three-week period. "It was almost overwhelming," she noted. als to meet the state-mandated requirement that by Oct.
and Church Street for his enterprise. "o Panfish and much more. this side of Heaven." ,.. Drivers carry less than $20. Drivers carry less than $20. Beach. Details may be obtained by calling 778-2099. 11, 10:45 a.m. Monday, cost $90. Classical figure drawing will begin its first course Oct.
ger White as instructor, $75 plus model fee of $25. ing Wednesdays at 10 a.m., $90 plus lab fee of $30. McMillen, $75 plus supplies for $35. taught by Chris Galanopoulos and Jerry Quin at 6 p.m.
Monday starting Nov. 19, $90 for six-week course. a.m. Tuesday, $13 per class. present its "Boat Smart" class from 8 a.m. to 4 p.m.
792-5300 10519 Cortez Road W.
, . L .-; IJT ,-,,"JP,QN,*.E. FE OCTOBER 312004,.
given away in one of four hole-in-one specials. any number of competitive ratings. fees, golf cart, dinner, and gift bag with a golf shirt. a "business after hours" event 5-7 p.m. Tuesday, Oct.
chamber members. Details are available at 778-1541. 29, with the opening reception at 5:30 p.m. Friday, Oct.
league's gallery, 5312 Holmes Blvd., Holmes Beach. day-Friday. Details are available at 778-2099. Maria Island meets Monday, Oct. 4.
tee Players entry in the Florida Theater Conference. watercolor painting by Jacquie Clark from 1-2:30 p.m.
Saturday. Details may be obtained by calling 778-6694. "Offer based on first visit enrollment. Our 30-min. workout gets you in and out and in shape! Pets & Property Services Inc.
damage to the native vegetation. she believes was due to criminal mischief. was already suspended on a previous DUI charge. Sept. 13, 2200 block of Avenue C, suspended license. A man was arrested for driving with a suspended license. stolen from a locked storage unit at the construction site. There was also damage to the door of the storage unit. with a combination lock, and took all the room keys. theft. A guest reported a rental bike stolen. of keys stolen from her vehicle. theft. A woman reported her bicycle stolen. bor reported that is was swinging open in the wind. Election (including Island city elections) Oct. 4.
visor of Elections Office at 741-3823.
caliber revolver and bullets wrapped up in a shirt. electric razor that officers suspected were stolen. more automobile and residential burglaries. and headphones he took from another vehicle. woman reported her designer shirt missing from her room. allegedly pushed her to the ground. residence was sprayed with black paint. man reported his cell phone stolen from his vehicle. dition to the auto burglary. that residence reported finding the car. confided he hid the items. only item missing was a roll of toilet paper. grams throughout the country, the producer said. tober is Domestic Violence Awareness Month. face. They might live next door to you. necessary to prevent or stop family violence." about safety as they walk. Holmes Beach Post Office parking lot. asked not to park in the Wachovia Bank parking lot. will be walking to school with students. and read with their parents prior to the event. a.m. to noon Friday, Oct. 1.
buy-one, get-one-free ticket offer to the Florida Aquarium. AME is located at 4700 Gulf Drive, Holmes Beach. 3:45 to 4:45 p.m. Oct. 5.
through imitating animals, shapes, number and games. dents can attend periodically at a cost of $10 per class. ister, call Phillips at 224-0292. Broken" will be screened at 7 p.m.
at the pavilion at Anna Maria Elementary School. last Monday of each month will be "movie day,"
which will be held in a classroom. AME's Kid's Live with the help of parent volunteers. 4700 Gulf Drive, Holmes Beach. Sackett or Thomas at 708-5525. Spanish Rice, Steamed Corn, "Fruity Shape Up"
- - -Juiee- and milk-are -served-with every-meal: - "
L i and the other children at the "Bee"
and then decline in market value? more than your Living Benefits? If so, we can help!! .- - buys the things you want! fep is nJus: Ai dund The Catwse. "* .-': '.! :. ; *"".. '_ .- t,'-*- s' .-::. :--- " . AC, heat, refrigeration. Commercial/residential. Repair/replacement. WEEK 2 BUC Contest Rollover $100 PRIZE FOR SCORE! were scouring the city on Monday inspecting damage. Frances, and fewer trees and power lines down. day and residents should prepare yard waste normally. about 80 percent of that bill. would blow around during Jeanne." afternoon and were dispatched to affected areas. out in the man's back yard. fire burned itself out, the man said. that the sand would migrate back to shore over time. damaged lifeguard towers and "severe beach erosion." tired of all the hurricanes. we don't have any more hurricanes," she observed. party in the media center. choose a brand new book for the library's collection. published within the past year. recently celebrated in the media center. could read about it," he said. chose a book called "Titanic Ghosts of the Abyss." 3-D viewer to see "ghosts" pop out of the page. and September birthdays by dedicating a new book to the media center and enjoying cupcakes and smoothies. which was rededicated during the celebration. commissioners at their Sept. 23 meeting. the Gladiolus Street-North Shore Drive basin. But few things are ever that good in Anna Maria. Maybe things are that good in Anna Maria. as the value of the land the project will encompass. value in the land to meet the matching requirements. Commissioners were to meet in a special session Sept.
expected to attend with accompanying data. get for the city to get the Swiftmud funds, SueLynn said. drainage in the city," she told commissioners. this has put a "strain"? on the private insurance sector. rates in the future, he said. Aug. 2, prompting the suit. sel needs to get "up to speed" on the case, he said. ney at their Oct. 14 workshop. and any fine imposed by the board. other purpose by a future commission. Anna Maria portion as well. which is urging interested Islanders to register right away. adults and seniors. The instructor will be Jo Gustavsen. cans to work full time in the old village. ing a friendly eye on his hometown and its goings-on. village until his death in 1977 at age 74. James Otway Guthrie arrived in Cortez at age 18.
east of Bay Shore, Junie said. of Cortez as it goes by. and perhaps in all Florida. ever there was a market." running some 1,200-1,500 head in East Manatee. ing most of the fish in the eastern Gulf in 1947-48.
going strong under the Bell name. in Palmetto "We had nhe Miami market sewed up,"
would drink together in the bars and fight," said Junie. and a few haven't forgiven him to this day. draw on the old wooden bridge." "What more can you say about a man?" Harry's record to 2-1 one game out of first place. Jessie's goalie Rip Shafer, who finished with 13 saves. ceived a pass at the six-yard mark from Jonah Castor. footed offering was again saved by Wilson in goal. could get a shot off. through ball to Kayla Arritt streaking down the middle. Shafer for a 1-0 lead for Harry's. to tie the game 1-1.
which carried into the half. shot found the near corner to tie the score at 2-2.
nah Schield for a 4-2 Harry's lead. ished the opportunity to end the game with a 5-2 victory. week. Read on to see how your favorite team fared. ,;. . ;, *. : "
after getting their team and individual pictures taken. a 5-1 victory over Jessie's Island Store Monday, Sept.
Castor notched the lone goal for Jessie's in the loss. during a Division II victory Tuesday, Sept. 21.
and Carson Wooten-Stipcich with one goal each. goal-scoring barrage in the Division I contest. Mr.
during Division III soccer action at the Center. for Mr. Bones in the loss. Kosfeld each notched a goal in defeat for Danziger. once to lead LaPensee in defeat. and Max Miller with a goal apiece. ''n '1 () '\, "
Hurricane travails, again: No more, please! Jeanne's appearance Sunday has precluded that desire. beach erosion is the legacy that Hurricane Jeanne left us. on to some other matters. that a hurricane was headed our way'? anchor if they couldn't make it to a safe haven. laden with treasure and men. lower clouds, there may not be much concern. tion slightly veered to the lower, watch out. i I H "!4 II . 1949 hurricane piled it full of seaweed. close, they all fly to the ground under bushes. hang around you or disappear. was going to be a big one. He just knew." mark," honoring the late, great Sarasota writer John D.
MacDonald and his fictitious character Travis McGee. Designated a Literary Landmark Feb. 21, 1987." a champagne reception in the hotel gardens. "Calvin Branche, a champion of John D.
Oct. 2 Travis McGee Day." (and I don't been there, did that). ricanes, at least new to me. to you in your dishwasher. dishwasher locks water IN and keeps water OUT. Tackle, bait, ice, fishing license provided! Park, 10005 Gulf Drive, Anna Maria. Ave., Anna Maria. Information: 778-1908. Fee applies. Blvd., Holmes Beach. Information: 778-2099. Cortez Road W., Cortez. Information: 792-3483. Drive, Holmes Beach. Information: 778-1788. Anna Maria. Information: 778-1908. Fee applies. Island Branch Library, 5701 Marina Drive, Holmes Beach. Holmes Beach. Information: 224-0292. Fee applies. Drive, Holmes Beach. Information: 779-9412.
screened-in canalfront lanai and oversized -'.co-car Ia. to help you get the home of your dreams. Center, 407 Magnolia Ave., Anna Maria, through Oct. 28.
through Oct. 28. Information: 778-1908. Fee applies. League, 5312 Holmes Blvd., Holmes Beach, through Nov.
2. Information: 778-2099. Fee applies. the Kirkwood Presbyterian Church Oct. 9. Italian buffet night at the American Legion Post No. St. Armands Art Festival at St. Armands Circle Oct.
Island Community Center Oct. 11. Performing Arts Hall Oct. 12.
caviatL How.e iEv H-oLm.es Beach. .
222 feet deep. Zoned R1. NEW LISTING Sun Plaza West Condo, 2BR/2BA with Gulf view. 778-0777 or 545-9591 eves, or Mike Carleton, 737-0915.
glass-top, six chairs. Excellent condition, $1,200. new, $400 or best offer. Weight bench and 210-lb. case, four lenses, $300. (941) 798-8342.
lander or call (941) 518-4431 for more information. FREE GUN LOCK. Yes, free. Just for the asking. sorry, be safe. One per customer. DON'T FORGET! The Islander has "mullet" T-shirts. Beach or order online www.islander.org. water canal. Direct access to bay and Gulf. Open floor plan. irrigation. $759,900. Call Piroska Planck, 730-9667.
or direct (941) 920-5156. MLS#105518. Would also make a great single-family home! Asking $699,000. sales racks. 511 Pine Ave, Anna Maria. 779-2733.
urday, Oct. 2, 8am-2pm. 417 63rd St., Holmes Beach. pets with in-home visits. (941) 778-6000.
has towing package. Ready for travel. Runs great. $2,000,-or best offer. (941) 778-1102.
nance free, 20-year warranty. (941) 685-7648. (770) 889-2887 or (941) 778-1367.
easy access to Gulf. (941) 794-8877.
than 30 hours. $5,900. (941) 795-5089.
fishing. USCG licensed. Ice, bait, tackle provided. weekends. Call Zachary, (941) 779-9783. Kari, Holly. (941) 778-3275 or 779-0793.
per half-hour lesson, three lessons recommended. Local teen, team competitor. Call (941) 778-0944. 13 years old, friendly and responsible. (941) 778-2469. Franchised". Call Joe Pickett, (941) 383-5543.
sun deck with Gulf and bay views. $975,000. news@Islander.org, fax (941) 778-9392 or mail/de-. BEFORE SCHOOL COUNSELOR: Earn $50 weekly. istrative office duties and daily center operations. the fun! Jack, (941) 758-2527.
land Historical Museum, 402 Pine Ave., Anna Maria. reshelving, and generally assisting library patrons. Call Eveann Adams, (941) 779-1208. Car Service. Serving the Islands. (941) 778-5476.
private lessons. Special $30/hour. Free advice. CONNECT-ICON Your local computer specialist. grades, maintenance, repairs, tutoring and training. wedding vows, sunset beach setting or wherever. Norman R. Veenstra, (941) 778-5834. CLEANING SERVICE Residential or commercial. cellent references. Call (941) 750-8366.
teacher. Expert repairs. (941) 383-5372.
cages, lanais, windows, doors. Call (941) 713-5333.
cleaning, departure cleaning, carpets, tile, grout. homes and commercial properties. Bonded/Insured. MR. BILL'S HOME REPAIR/maintenance service. and the best results from service advertising! style ol Frank Liid v'/jngrni, rnerring walls CI - i .
miss this secluded and wonderful waterfront retreat, priced to sell at $1,299,000. rates. References available. Call (941) 722-4358.
mation at Restless Natives, (941) 779-2624.
ning to advanced. Contact Koko Ray, (941) 792-0160.
ates a portrait. I want to be at your wedding! a view of Spring Lake and is only a block to the beach. $397,600. and Tennis Club Mark II. property has it all! $799,000. and bay! Built new in 2001.
a new fenced in back yard. Three oversized bonus rooms not included in square footage. Great investment! Offered at $644,900. S'. two blocks from the beach. up for bay views! Call today for your viewing appointment. $625,000. price call Sebastian, (941) 704-6719. 2BR/2BA end unit. Screened porch overlooks lagoon. vaulted ceiling, walk-in closets, guard-gate, entry. 2BR/2BA, updated condo with deeded boat dock. ets, Jacuzzi tub. Carport and heated pool. $359,900. Holmes Beach. Short walk to prime beach. $799,000. ment. Just steps to beautiful beach. $749,000. place. On sailboat water with large deeded boat dock. Heated pool, carport, short drive to beach. $329,900. 3BR/2BA Key Royal Canal Home, $2,800. 2BR/2BA Gulf Sands Condo, Gulffront, heated pool, S3,000. 2BR/2BA Ground-level duplex with heated pool, steps to the beach, $2,800. 2BR/2BA Ground-level house, close to the beach, $2,500. I1BR/1 BA Ground-level condo with pool, tennis, $1,400. 2BR/2BA Condo, close to Bradenton Beach, $1,500. cept for the price only $742,000. e c Quality & Dependable Service. -j r C k r.
references. For pricing, call (941) 713-5967.
discount. Call (941) 778-2581 or 962-6238.
service. Call (941) 761-3000 for free consultation. Island resident 25 years. Call (941) 807-1015.
timates. Call Larry at (941) 795-7775, "shell phone"
references. Dan or Bill, (941) 795-5100. KEN & TINA DBA Griffin's Home Improvements Inc.
and shutters. Insured and licensed, (941) 748-4711. TILE, CARPET, LAMINATE supplied and installed. Why pay retail? Island resident, many references. Coverings. (941) 792-1367, or 726-1802. Chris, (941) 795-3034. License #104776. Insured. sured. Call Javier at (941) 685-5163 or 795-6615.
debris. C-squared contractor. (941) 345-3092.
pairs, renovations, kitchens, bathrooms, decks. I do show up! (941) 778-3904. E&N PROFESSIONAL painting and decorating. plumbing. For estimate, call (941) 545-0808.
perience. (941) 778-3526 or 730-0516. Co., (941) 778-6665 or (800) 749-6665.
rate, $1,200/month. Call Ron, (941) 228-5154.
month, $1,500/week. Call Tom, (559) 760-1331.
contact, (941) 753-8709, ext. 2.
read Wednesday's classified at noon on Tuesday. monthly, seasonal rentals. By owner. (901) 301-8299. Dolores M. Baker Realty, (941) 778-7500.
sf. For information call (941) 778-0777 or 545-9591.
or 2BR/2BA. Private and secluded, steps to beach. able now through Nov. 30. No pets, nonsmoking. Moynihan, Realtor, (941) 778-2246 or 720-0089.
month. SunCoast Real Estate, (941) 779-0202.
deposit. (941) 778-0292 or 650-3552. (800) 732-6434, SunCoast Real Estate. week or $2,200/month. Call (813) 289-9814.
choice of 2BR or 3BR, fully-furnished apartments. Tropical setting, laundry, cable, sundecks, private. Realty Co. (941) 779-0732 or (866) 779-0732. ANNUAL RENTAL: North Shore Drive, Anna Maria. large kitchen, no pets. $755/month, plus utilities. Call (941) 922-2473 or 928-3880.
annually or seasonally, $750/month. (941) 447-6278.
designer furnished. Pool, laundry, walk to restaurants. Opens Jan.1. $900/week. Call (901) 301-8299.
pets. (813) 689-0925, e-mail: HlmsBchRntl@aol.com. DEADLINE: NOON MONDAY EVERY WEEK for WEDNESDAY'S PAPER: Classified advertising must be paid in advance. direct e-mail at classifieds@islander.org. Office hours: 9 to 5, Monday-Friday, (Saturday 10 to 2 as needed). additional word over 20 is 500, Box: $3, One- or two-line headlines, line rate plus 250 per word. USE THIS FORM FOR YOUR CONVENIENCE: One word per blank space for minimum charge 20 words. For credit card payment: '_ LJ '. No. 2217 CllI.r D IV NOT.llI \Al)LNrON lO5:Ao I. IF\ 34217 ,. . Call me to find your dream home. On vacation or just hate doing laundry? Why bother? BA Y WEST WILL PICK-UP, LAUNDER AND DELIVER. We bring new life to any floor. mulch, trip, hauling and cleanup. .. .. PRIVATE BEACH Annual. 2BR/1BA, new floors. No pets. $685/month. (941) 778-1086.
quiet area. Off-season, $850/month, $550/week. ANNUAL AND SEASONAL rentals available now! month; Mariners Cove condos, $3,400/month. RENT it fast with an ad in The Islander. 12,100 sf homesite offered by owner/Realtor. 383-6112, or George Noble, (941) 685-3372.
or Dave Guy, (941) 284-5469 or 284-5461.
lar homes. Reduced to $725,000. (941) 730-1086. TWO UNITS, each with 1 BEDROOM AND 1 BATH, TURNKEY. 100x100 lot, just steps to beach. Zoned multifamily 3-10 units. high-and-dry street in Holmes Beach. Community laundry area. Large covered patio allows for outside entertaining. BAYFRONT LOT 50-by-200-feet. Fantastic view. Zoned R-2 for duplex. $720,000. (740) 965-6934. Island, $575,000. Call (941) 812-9593. COMPLETELY REMODELED and updated condo! pantry, dock. Walk to shopping, restaurants, beach. (941) 518-3054 or (330) 686-8765.
acres Albemarle County, VA. Friday, Oct. 15, noon. Kathy Caserta 1_80(_)0 7-io017 -1 oll-0-ree. More than 35 Gulffront rentals to choose from. Call us last! Best rates on the beach! $13,676; 42x42, $7,995. (800) 993-4660.
in the cool western North Carolina mountains. Mountain Realty, GMAC Real Estate, Murphy. VIEWS! VIEWS! VIEWS! North Carolina mountains. zerland, halfway between Asheville and Boone! secluded, wooded, paved road, driveway, house site. YOUR NEIGHBORHOOD REAL ESTATE SHOPPE. setting. Enclosed balconies plus third balcony. $470,000. three 1 BR, room for pool. Great investment. $870,000. MARTINQUE Gulffront 2BR/2BA, pool, tennis, elevators. BEACHFRONT 3BR/2BA home, tastefully decorated. that! Not having to put your hand in your pocket at year's end to cover expenses. into the black. Island Aussie Geoff (941) 545-0206, (800) 653-1913. | t\liful lush garden $.139 500 t.LS. R J,,Fri mn $599 000 MLS# 105752.
,- -- .r .C % . Gulf views. $1,099,000. MLS# 98602.
i .. a l .r. 109 "Want to grab a bite?" 31 "Was that so hard!?" I--m- i Answers to the NYT Sunday Magazine Crossword are published in this week's Islander newspaper. O nl, lir ir. T:l n rr ial' r,3i1 .ar,] h nirii_--, ,.., r uo _' 1:. bu. uild I- n ir ,, .nil: -i r.,-_,j,: I- ,h :,_-_d. ing ihr,..uqr,',ul ,:.r,,'.r, r,-Ir..]i ': 3,',:_rhi iirhrin Fr r,,i:r, ,ca ir,r %pr -_ i i ..',ind . :,c I l.
Iir e rriny nice l 3iur,. : r, ,Open p3:. :..Ju ni[. :rh nr, rn C r:,r3a ,' n.jni .n.r:, r ,- ',: u l ,:,. docking. Anne Miller, 778-2246. #100997.
approximately 2200SF. Stan Rutstein. 727-2800. #104439. Pricing starting at $1,275,000. beach. Harold Small. 778-2246. #104972.
ranty. Becky Smith or Elfi Starrett. 778-2246.
ings, loft family room with great views. warranty. Joe Corbo. 778-2246. #105417. #105510. $405,000 Gina and Peter Uliano. 751-0670. #105644.